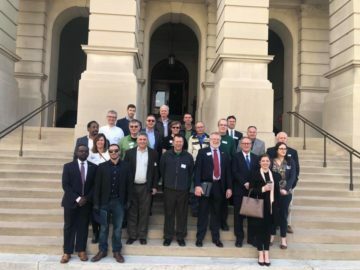 Several weeks ago I participated in a citizen lobby day for electric vehicle (EV) issues at the Georgia Capitol. Although I’ve been an advocate for clean energy policies for many years, this was my first time actually going to the legislature to speak with lawmakers myself. I joined a group of EV owners and advocates (organized by our colleagues at SEEA– thanks!) to speak with our representatives about EVs. 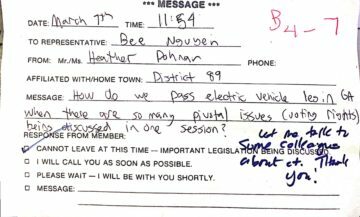 Now that the legislative session has wrapped up for the year, I’ve been reflecting on my experience and what I learned on Capitol EV Day. This year, Capitol EV Day coincided with “crossover day”. Crossover day is the last day for all bills to pass from their chamber of origin to the other in order to be considered for passage. Many significant pieces of legislation all faced the same deadline to be eligible for consideration during the session. This meant it was an incredibly busy day at the Capitol. A new EV-user fee bill had been introduced, HB 265, and a new tax credit bill was “in the works.” We knew that neither EV-related bill was likely to “cross over” this year, but we were successful in sharing the value of EVs with Georgia legislators and demonstrating wide support. Following our morning briefing and photo op on the steps of the Capitol, the group of advocates went into House chambers. We sat in the gallery so we could watch the activity on the floor as legislators prepared for the session to convene. House representatives started the day’s session by making announcements on legislation that would be discussed that day. It was during this time that our group was formally recognized when Representative Scott Holcomb made a declaration announcing that the day was EV Day, speaking of the benefits of EVs in the state of Georgia. After the EV Day declaration, I left the gallery to ask to meet with my representative. Lobbying the legislature in person is a little different in every state and also depends on the preferences of the legislator you’re trying to meet with. Before this, I had thought that most meetings were only made by appointment and mostly took place before the start of session. But I learned a lot of meetings during session happen by pulling legislators off the floor and talking with them “on the ropes” in the hallway outside chambers. The process of meeting “on the ropes” is akin to passing notes during class: there are sheets of paper (see right) where you write your name and a quick note to the Representative about what you want to talk about, aides give them to the rep, and then they check the box to indicate their response. There are several options for their status: “can’t talk because legislation is being discussed”, “I’ll return your message via phone call”, or “I will be with you shortly”. Since it was crossover day, “cannot leave at this time” was a pretty common response (and for good reason). Another advocate who lived in the same district as me also couldn’t get a hold of our representative. However, I went through the same process to speak with other sponsors of the bill to thank them for their support and get advice on how to pass EV legislation in Georgia. On my third try, I was a little surprised (and excited) when one of the aides returned from the House floor to tell me the requested representative would come to meet with me shortly. My goal was to get insight into a genuine question I have about the legislative process: with so many bills competing for the legislature’s attention, how can we get EV legislation passed in Georgia? I spoke with Representative Spencer Frye, cosponsor of HB65. He assured me that it was both possible and a priority for Georgia to pass EV legislation, and that despite not making it to the Senate, both bills are still eligible for consideration in 2020 during the second part of the legislative session. One key thing that EV advocates will need to do is build support during the “offseason”. Georgia’s legislative session runs in two-year cycles, so by filing a bill in 2019 it allows important advocacy work to be done in support of the bill between now and the upcoming session. Our efforts on EV day were helpful in not only making sure that EV bills “crossover”, but also in setting the stage for legislators to introduce or sponsor other legislation that may be beneficial to EVs. 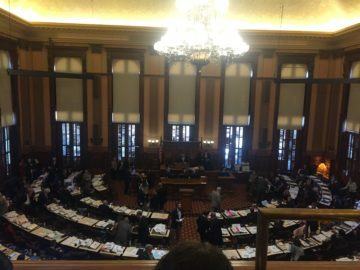 It’s been only a few short weeks since EV day, but several legislators have already made good on their words: on the final day of the 2019 Georgia General Assembly, Reps. Todd Jones, Andrew Welch, Kasey Carpenter, Scott Holcomb, and Micah Gravley introduced House Bill 732, which would reinstate the $2,500 tax credit for the purchase or lease of new plug-in hybrid electric, electric and zero emission vehicles (ZEV). A press release from Representative Jones on HB 732 states that, “Prior to 2015, Georgia led the nation in electric vehicle (EV) sales, which spurred new businesses and increased consumer choice”. This bill, if passed next year, will offer the opportunity for Georgia to again be a leader in transportation electrification and support this growing industry. If you are interested in engaging in this effort during the break, please contact Anne Blair at ablair@seealliance.org. Thanks to all the representatives who took time to meet with Georgia’s EV owners and supporters. See you next year!